Story: Some wise man said - "The more you learn the more you realize how little you know!".. I'd say - "The more you try different cuisines the more you learn different ways of enjoying food!". If you've read even a couple of posts from my blog, you'd know, I was brought up in a foodie family and I married into a foodier family. So trying out different combination of flavors is a routine in my kitchen..
Why am I talking about combining flavors.. well - because the first time I tried fruit with seafood was in this restaurant called Banana Leaf in California. My brother Neeraj took me there and I remember eating the Pineapple fried rice with shrimps.. I'll skip the "oohs and aaahs".. I will just say the taste is still fresh in my mind after 10-ish years. Until then I had eaten fish only in a really spicy Indian masala.. and this new thing about adding fruit and nuts to meat was an awesome revelation! and yes - I have had the Mango fried rice in many thai restaurants.. but I assure you Banana Leaf has a one of kind taste... :( :( now I am missing the taste..
Ok - so this recipe of Mango relish is simply delish.. and you can add it to - ANYTHING you feel like - I added it to grilled catfish and turned out to be a nice little twist to the Fishy Friday routine in my kitchen. Also - With this post, I'd like to introduce a new label for the recipes on this blog - The AshaCool label. All AshaCool recipes are completely made up by me.. and they have passed the 'blogworthy' test at home! Cook the large chunks of mango in microwave with a little bit of water. Once these pieces are cooked, blend them with corn starch to form a binding mixture the relish. Now heat butter in a pan, once the butter is melted, add the corn kernels and the cut red pepper. Saute till the Fresno pepper softens. Then add the mango pieces and saute for another minute. Now add the binding mixture and mix well. Heat for a couple of minutes. Add salt and sugar as per taste. 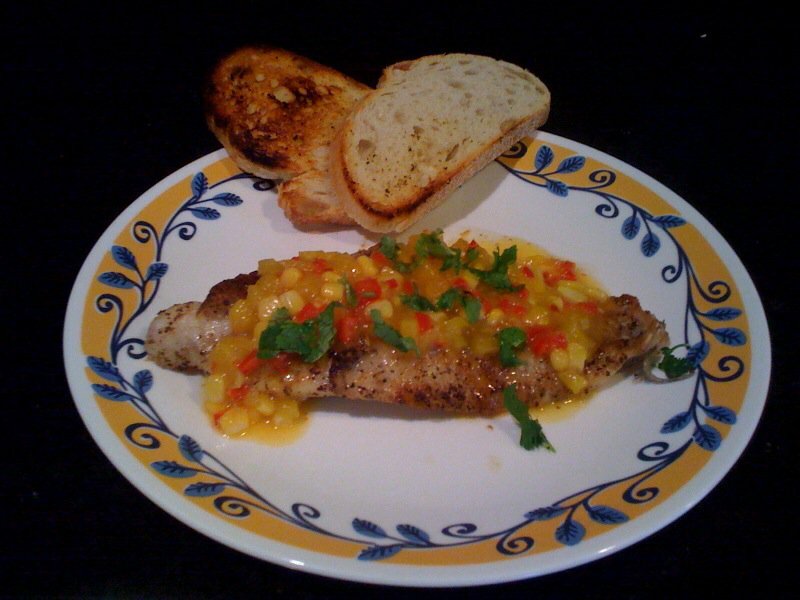 When serving with grilled fish, garnish with finely chopped cilantro. Today, I will be trying a toast with this relish and mozzarella cheese.. will add a picture here if it tastes good.